When something wonderful happens, we celebrate. A wedding, the birth of a baby, a graduation, a new job, retirement or a home purchase. These are the milestone events but what about the small everyday things? In our house, we celebrate the small things. Yeah, the vacuuming is done! That is a big deal for someone who does not like to vacuum. There is so much that is challenging in life. There seems to be an endless to do list. Begin to notice the small wins and honour and celebrate those. 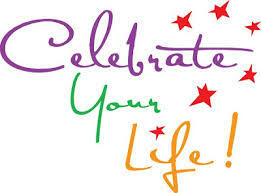 Once you start, it changes the focus of your day and you begin to search out things to celebrate. Then you start to accomplish more just because it is something more to celebrate. Once you start, it opens new conversations. Instead of talking about what did not work and what went wrong, and there are plenty of those things, you focus on what is working and what went right. You get more of what you focus on so focus on the good stuff.